I really like seasonal books. They have been such a wonderful way for our family to really learn about the various seasons—whether they are natural or liturgical. They add to the time of year, enhancing our appreciation for whatever season we are in. 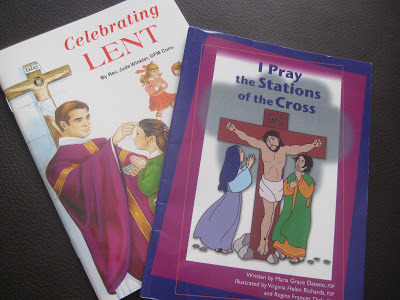 As I was preparing our home for these 40 days, I realized that we have compiled a collection—albeit small collection—of Lenten books. Here are a few of our favorite ones. Some old and some new. 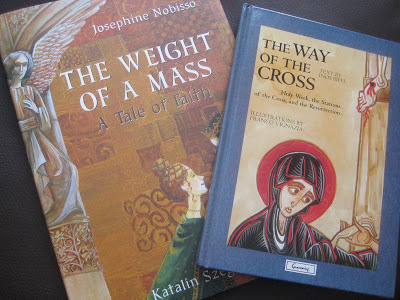 Also, this year, I chose two spiritual books to read during Lent. I am trying to turn off the TV more and resort to reading and listening to audio books. This wouldn’t be so hard, but with a three-month-old baby who is up a lot during the evening, there is only so much I can do while tending to him. 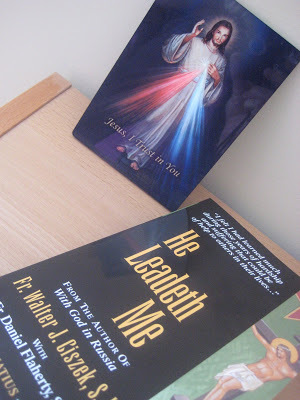 One of the books I chose is He Leadeth Me. So far, this book is incredibly beautiful. I am so inspired by the message of complete dependence on God. How can I learn from this author’s experiences and insights? How can I personally detach more from this world and turn ever more to Him? I also chose One Thousand Gifts, which I am trying as an audiobook. I have really appreciated Ann Voskamp’s message of gratitude. Not only for the obvious things, but for little things and even things that are difficult yet important for conversion. I find myself so often complaining about this or that, feeling like I don’t want to do the vocational duties God has given me to do. It is all about attitude, and mine could use some work! That is why I want to read this book. I actually think both of my picks may end up helping me in this area of life.